Green anoles live throughout the southeastern coastal plain, where they are a common sight even in urban areas. But their population may be going down. They have a new competitor in the brown anole, an invasive species from the Caribbean. Brown anole. Looks harmless, doesn’t it? This is bad news for the green anole, but it does offer humans a chance to see natural selection in action. 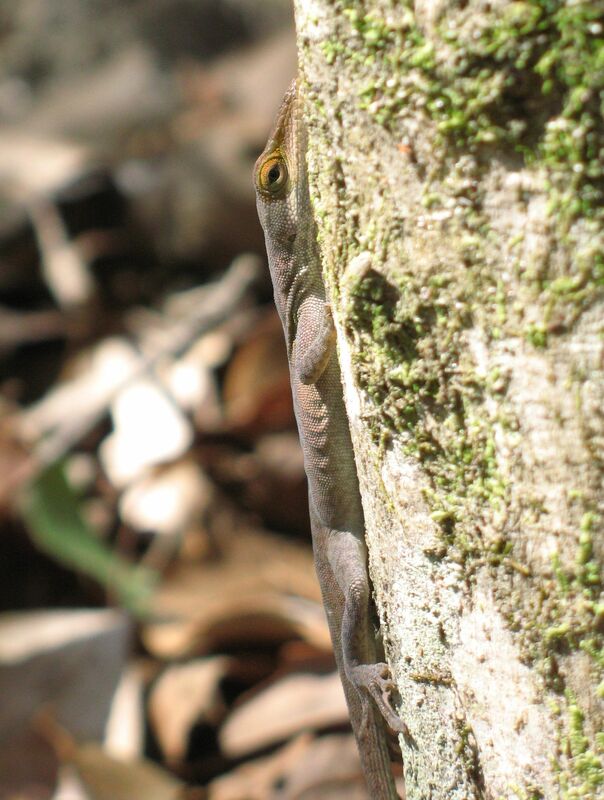 The brown and green anoles’ ecological niches1 overlap, but are not exactly the same. The brown anole is a better competitor on the ground, but the green anole is a better climber. As the brown anole, which lives mostly on the ground and lower parts of trees, spreads into the mainland US, the green anole plays to its strengths and spends more of its time high in the trees. This change in behavior would be interesting enough, but there’s also evidence of physical changes. One experiment found that on islands where brown anoles were introduced, the green anoles had evolved larger toe pads, which helps them climb, after only 15 years. On similar islands with no brown anoles, the green anoles were not restricted to the tops of trees, and had smaller toe pads. A noticeable physical adaptation in 15 years? I believe the scientific term for this is so damn cool. This is such a neat little creature!! Coincidentally, a friend of mine is visiting her family in Florida this week and just posted an instagram picture of a brown anole hanging out on the patio furniture! They are everywhere in Florida! Both species are. My parents’ house always has green anoles on the porch screens. They’re fun to watch. Cool! I remember my sister got some from a pet store when we were kids in West Virginia. We convinced my little cousin they were baby dinosaurs, because that’s what you do with little cousins. We don’t have green anoles over here, but I was always intrigued by the bags on necks their counterparts carried here. Now I know what they are for! Thanks. And yes I never thought adaptation could be so fast as all I conceived from my Biology classes was that it takes many generations and hundreds-thousands of years. Thanks for this intriguing and enlightening article Bethany. It’s unusual, but not completely unheard of. Small adaptations can appear pretty quickly. It usually happens on islands with small populations. The finches of the Galapagos are probably the most famous example. I understand. I didn’t study it meticulously. Small adaptations together finalize the bigger ones it seems 🙂 Thanks Bethany! Seems like you have a good understanding of it to me! Thanks Bethany. Coming from you I take it as an appreciation. An honor! Aw, thank you. I think you’re giving me too much credit, though. I’m not an expert by any means. Another lovely and very interesting post!